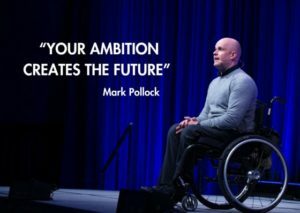 At the Mark Pollock Trust, we know that breakthrough therapies have been discovered and some will be made available to paralysed people within the next 10 years if, we support our collaborators to navigate a pathway from scientific breakthrough, to regulatory approval and commercialisation. 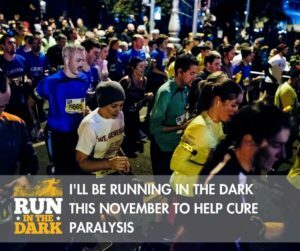 So, we believe we can cure paralysis in our lifetime. To do it, we are exploring the intersection where humans and technology collide, catalysing collaborations that have never been done before and unlocking $1 billion to make the cure a reality. And, taking a systems change approach to accelerate progress towards the cure, we measure our impact through the breadth of engagement we generate, the quality of connections we create and the improvement in efficiency that we achieve. But we need your help. 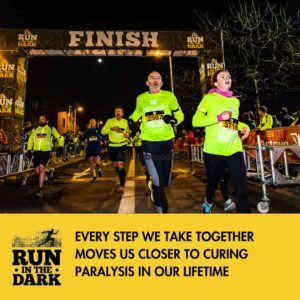 Every donation, every step, every study, moves us towards a cure for paralysis and enabling people to walk again. The next step is to get your fundraising page set-up which takes less than 1 minute. If you’ve already created your page, share the link with your family and friends. 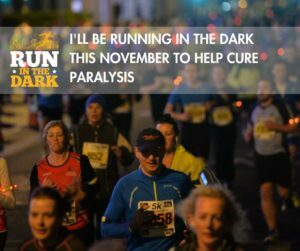 Last year, the average Run in the Dark fundraising page raised €250, enough to pay our research scientists for a full day. Once you’ve created your page, you can use our collection of images, graphics and videos below to help you get started. You can share them on Facebook, Instagram and WhatsApp in a single click. Or download our sponsorship card here. 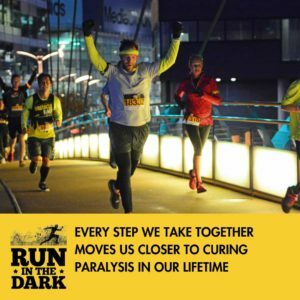 CHOOSE YOUR RUN LOCATION BELOW TO CREATE YOUR FUNDRAISING PAGE. Now you’ve set up your fundraising page, you can start on the fun stuff – personalising your page and sharing it with friends and family. You can find some really helpful fundraising tips here. Set up your fundraising page on JustGiving and make sure to add a profile photo. Share the link with your family and friends across all your social media and communications platforms. Images and videos work well – feel free to use our selection of photos, graphics and video below. Click here to download the images below. You can share them on Facebook, Instagram, Twitter, or send them to your family, friends and colleagues through email or Whatsapp to ask them to sponsor you. Remember to include the link to your Justgiving fundraising page.